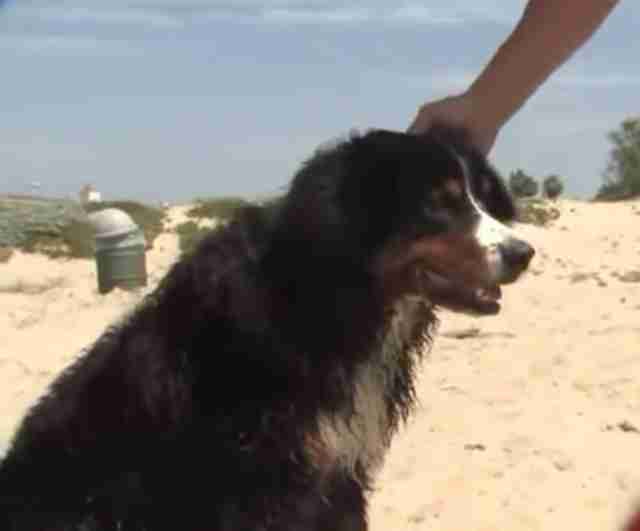 Two swimmers out for a day at the beach in California were saved from a potentially deadly situation, all thanks to the quick thinking of a recently adopted dog named Nico. On Thursday, a woman on a boogie board was pulled out to sea in the strong current off the coast of Ventura. Her husband tried going in after her, but he ended up being overtaken by the riptide too. Fortunately, the 3-year-old Bernese mountain dog and his human, Dan Clarke, happened to be passing by on a walk. "It was getting close to sunset and no one else was in the water," Clarke told The Dodo. "I just saw this large gentleman pulling his wife on a boogie board against the riptide, 50 yards out. As soon as I saw where they were, I thought, 'That's not good.' People have drowned in that exact spot before." Clarke, who was a lifeguard in his youth, knew he had to do something to save them. Little did he know at the time that it would be his dog doing the saving. "They were exhausted. So I ran to the beach, took off my shoes and shirt and ran into the water. Then Nico ran in just charging toward them. 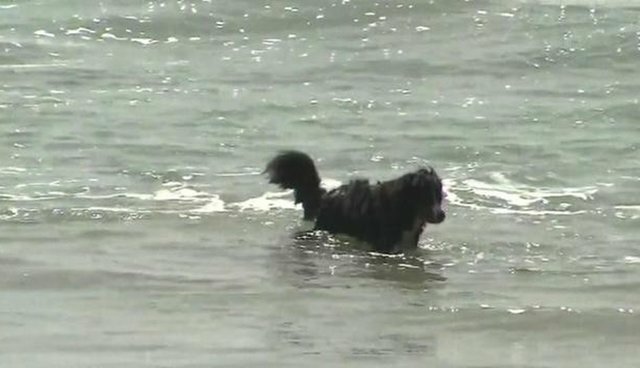 I didn't even know the dog could swim that well," says Clarke. "I looked and the dog went right up to the guy, spun his body around next to him. I yelled, 'Grab his tail!' That dog just worked like I've never seen him work before, just pulling that guy all the way to the beach." Without hesitating, Nico then turned and headed back out into the water. "He took off back after the woman with the boogie board. When he got to her, he spun around, and I yelled, 'Just grab him anywhere!' So she puts her arm around his chest, grabbing his fur, and he pulled her all the way in," Clarke says. "Then he just shook off and looked at me like, 'All right, can we finish our walk?' It was insane. My jaw dropped." "The gal looked at me and asked, 'Does this dog come with some lifesaving certificate?' All I know is that I've had three of these dogs, and Nico is the only one that I've seen swim. They were like, 'Wow, that's incredible.' This guy is just a swimmer." Clarke says he adopted Nico just two months ago despite cautions that he was temperamental and might not be the easiest to train, but the dog has already proven he's more than just a pet. "I look at Nico in a whole different light now," says Clarke. "It's like, geez, you saved these people's lives." This isn't the first time a rescued pet has gone on to return the favor in an act of heroism, proving that by saving the life of an animal, others too could be saved.